I was all set to load up my next top from my infamous List of 17 (tops to be quilted) when we received an invitation to a family baby shower! All my current projects were immediately put on hiatus until I could get a baby quilt finished. I had every expectation of getting it completely done in time for the baby shower .. I did have about 2-1/2 weeks lead time. I have been collecting ideas and patterns for cute baby quilts over the years. You just never know when you're going to need to whip one up quickly. Instead of using one of the oldies-but-goodies in my folder, I decided to use a newer pattern called "Just Ducky", designed by Cheri Leffler. Like all successful baby quilts, this one is cuter than a bug's ear and the construction is pretty doggone fast. 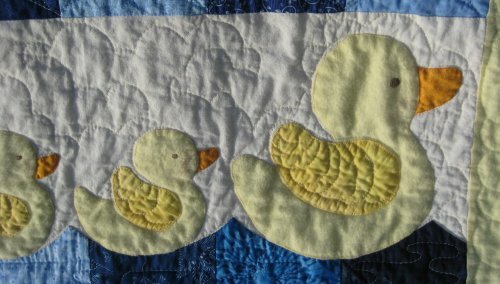 The pattern calls for the rubber duckies to be fused and edge-stitched. I've seen this technique in various quilt shows but have never done it myself. Since this was to be a gift (that I hope will be thoroughly used and laundered often), I had concerns about the durability of the fused and edge-stitched appliques. My quilting friends assured me that it really is a viable technique that can withstand laundering. But ... I still had my misgivings. The family having the baby are just the nicest people you'd ever want to meet (otherwise, I'd never even consider making a quilt for them). For a gift, I wanted them to believe that this was a *quality* quilt but fused applique just looks unfinished to me. I sure didn't want them to think that this was a slapdash construction! On the other hand, there is *no way* I'm going to do needleturn applique on a baby quilt! Even with the assurances of my quilting friends, I decided *not* to use the fused and edge-stitched appliques and instead went with a machine applique technique. 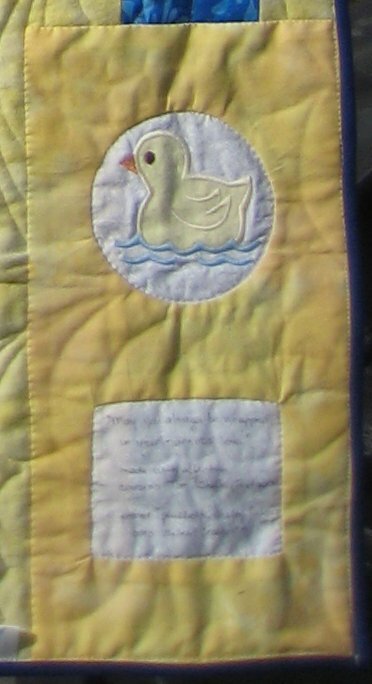 I used yellow lightweight flannel for the duck appliques and yellow borders. 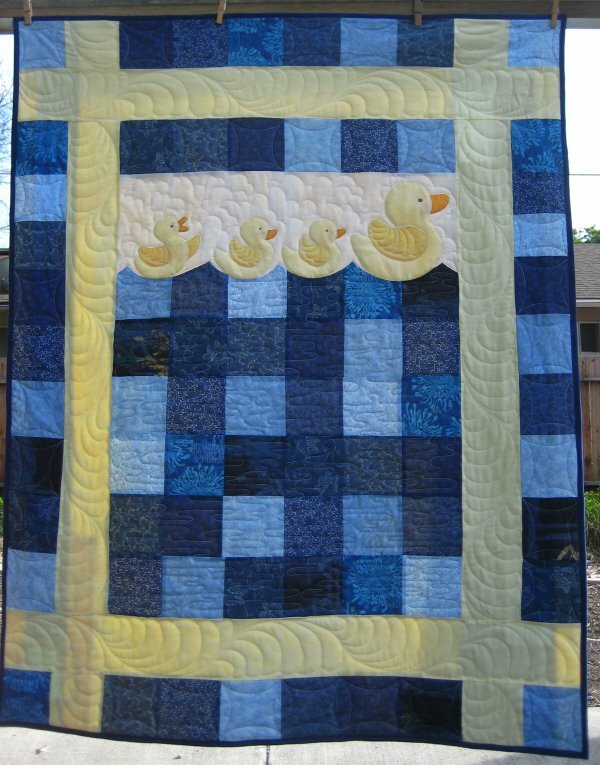 The duck wings were a slightly darker shade of yellow in standard quilting cotton. The sky strip is an ecru tone on tone. I did turn under all the edges and then used a narrow zig-zag in a matching color thread to stitch the applique to the background strip. 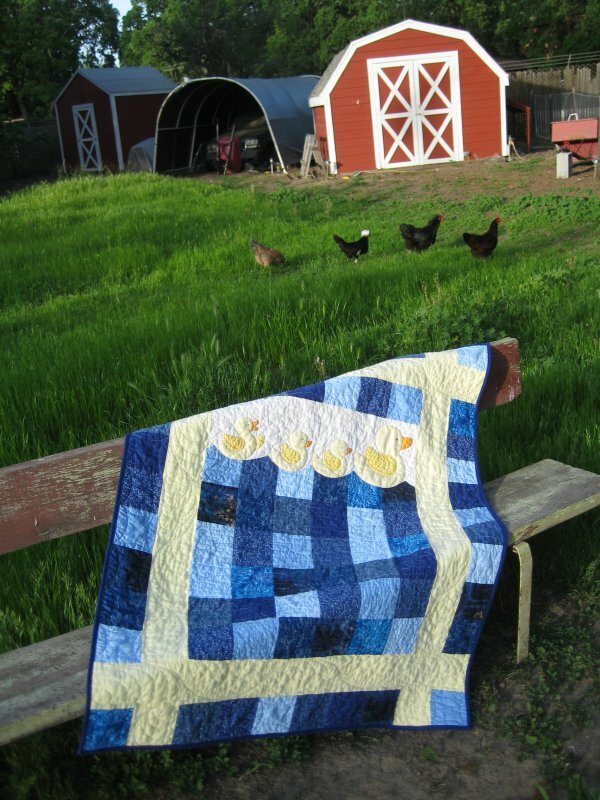 The water area is a delightful mosaic using 10 different fat quarters in blues, as is the outer border. The backing is Northcott's heavyweight flannel in yellow. Geez, it's annoying when 1) fabric manufacturers decrease the width of fabric and 2) said fabric then REALLY SHRINKS when being washed. aarrggh. After washing, the flannel I bought for a backing became TOO NARROW for the top. aarrgghh. Yes, I understand that manufacturers are feeling the pinch of the economy. Their choice: decrease the width and keep the price per yard the same or keep the current width and increase the price per yard ... which is *already* higher than the nuts on a giraffe. But, even knowing that reality, it is STILL annoying that the flannel is TOO NARROW for the top I made. aarrgggh. The eventual solution: insert a mosaic panel in the backing to make it look like *intended* to do it that way, i.e. "artistic statement". hmph. And THEN .. just to make everything So. Much. Better., when I was slicing through the backing, to create the space for the panel of blue blocks, my brain obviously wasn't engaged. I didn't slice off just one side. Oh no. I managed to have it folded so I sliced off BOTH edges. Cripes. So, now instead of having just ONE panel down the back as the "artistic statement", I have TWO ... one wide and one narrow. Really .. unbelieveable. Then came the quilting decisions. This is continually my dilemma: what to do!? what to do!? Luckily, for this project, the quilting was straightforward .. thankfully! It was all free-motion quilting, except for the continuous curves and feather spines, for which I used a template to give me the smooth curves that look so nice. * feathers in the yellow border. I chalked in division points on the border so I would know where the spine of the feather was supposed to switch from going "up" to going "down". I used an oval template to give me the smooth curves and did the feathers free-hand. I used Carla Barret's tutorial for these feathers. It wasn't until all the quilting was done and I had it hanging on my design wall to admire that I realized .... duh! ... I probably have turned the corners on the borders instead of making them straight runs! Then again, I would have had a problem with what to do with the small pieces of the border that extend out out to the edges. So .. I guess what I did was the better decision! These feathers looked soooooo crisp and clean when I was quilting them; that's when I like the quilting the best. But I knew once it was washed, it would have a certain amount of "wrinkly" even if you pre-wash all the fabrics. I figure that's because I do *not* pre-shrink the batting. So, here's a comparison of the feathers in the border before and after washing. I've been trying to keep notes on how long the quilting process takes me. For this particular quilt, the initial loading took 1/2 hour; the initial quilting took 1-3/4 hour. Then I turned the quilt to do the other borders; that took 10 minutes. The remaining quilting took 15 minutes. Total quilting time was about 2 hours. Now, this wasn't 2 hours at one time .. I had various distractions and interruptions, so it was really done over a couple of *days*. 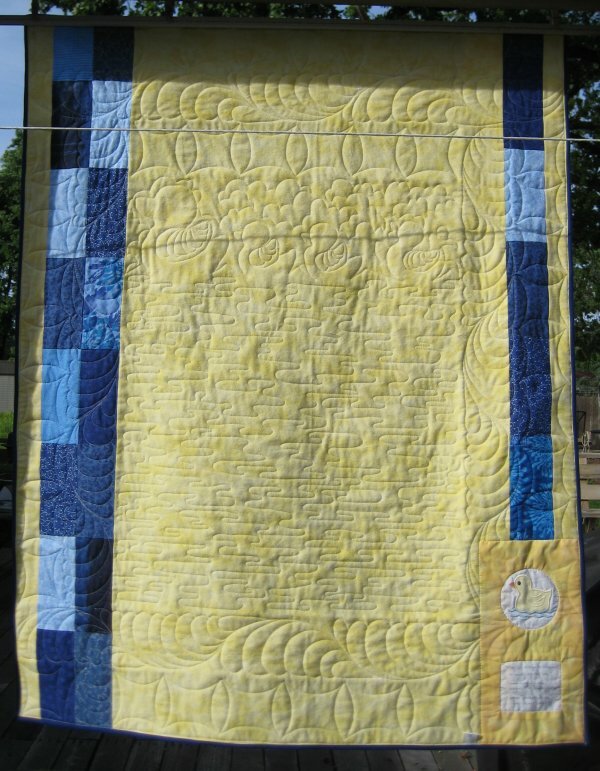 For the batting, I used Quilters Dream Poly, thin loft. Nice stuff! I have no objections to using it again. As I mentioned earllier, this quilt is for a new baby in Mr. Pirate's family. We don't know the parents (Mr. Pirate's cousins once-removed) *all* that well, so I didn't want to use my personal pirate label. Instead, I found a machine embroidered 'rubber ducky' applique in my design stash. I embroidered that on a scrap of the sky fabric, which was then inset as a circle into the label fabric. Lower down on the label, below the ducky applique, I inset a hand-written sentiment for the new baby. This was a little tricky ... the gender was known, but no name. And even if the name WAS known, it's not a really good idea to put it on the label before that important birth certificate is official, as the parents could change their minds! What I think I'm going to do is tell the new Mom that once the baby's name is decided, I'll hand embroider the name on a ribbon and hand-sew the ribbon onto the label. Once I got the two inserts put into the background fabric, I realized that I REALLY got carried away with the size of the label. :-( Once again, I obviously didn't have my brain engaged because this one is just over the top, in terms of size. But .. but .. but .. I did such a good job on the insets, I really didn't want to rip them out to make a smaller label. 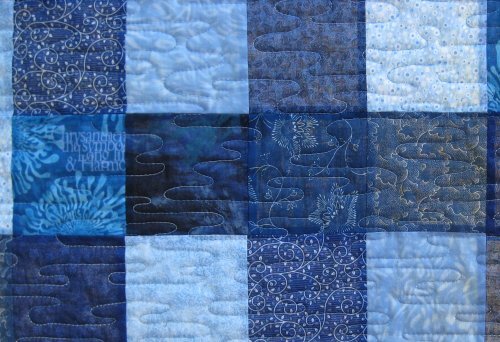 As for the binding, I used a solid dark blue quilting cotton.